As ladies, we all know how wonderful stockings and tights make us look and feel, but, we also know how annoying they can be to take care of! One slip or lack of concentration can lead to a ladder or hole and no matter what anyone says – that is never a good look! 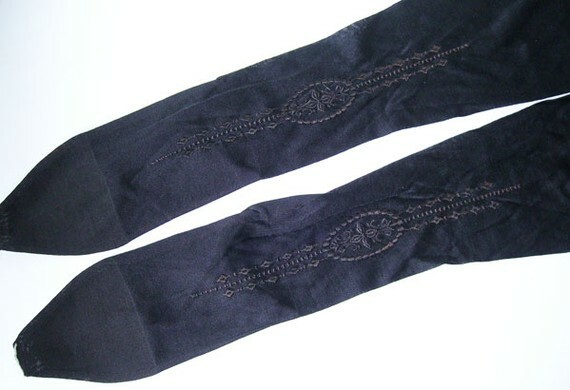 Firstly, nylon hosiery CAN be machine washed, but only using a cold water setting. Plus, they absolutely must be washed on their own – so machine washing can cause more trouble than it’s worth! The best way to care for nylon and silk tights and stockings is definitely hand washing! Sorry, I know this seems a bore, but if you want perfect looking pins, sacrifices must be made (you should be treating all your lovely lingerie the same way, but I won’t judge you.. much). Before you even begin washing your hosiery, check your nails! Make sure to file away any jagged edges, also remove any rings. You don’t want your precious tights to get caught and ladder or rip! Now, fill your sink with lukewarm water and add half a cup of mild laundry powder (you can even use colourless shampoo if you don’t have any washing powder to hand!). Turn your stockings or tights inside out and allow soaking for five minutes, remembering to wash similar colours together. Now wash the products carefully, avoiding rubbing and pulling as you will stretch the hosiery making it unwearable. Rinse, rinse and rinse again in cool water to get all the soap out and then gently squeeze the water out of the tights or stockings from the top down to the toe. Once all the excess water has been removed, place the tights or stockings over a towel rail or something similar to air dry. Keep hosiery out of direct sunlight as the colours will fade. When you wear your stockings or tights, avoid anything that they could snag on like corners of desks and tables or wooden seats and always carry a little bottle of clear nail varnish with you to dab on a hole or ladder as soon as you notice it! As for storing your stockings and tights, either fold them nicely (even better if you have the original packaging) and keep in a drawer or hang up on a padded hanger. Rolling them up into a ball will cause them to become misshapen! I've had the most amazing time away in the tropics, somewhere hot is always a must for me, although it did mean I missed the debauchery that was Playful Promises' new Boutique Launch party..
Firstly when you buy stockings look for serious brands. Playful Promises recommends Cervin stockings. Cervin have four or five stocking sizes and these are calculated by height and weight of the wearer. I truly believe that purchasing a more expensive brand of stockings will achieve better results, as they will fit you perfectly around your calves and thighs and importantly will be the correct length for your leg. The best stockings are often silk stockings, nylon stockings or even vintage stockings, however these can be very delicate! I like to buy seamed stockings, it elongates your leg and fits your calf and leg beautifully, Cervin make wonderful seamed stockings that are dramatic, peferct for me! Also when purchasing stockings to wear with a garter belt look for a wider welt. A Welt is the top part of the stocking which will be fastened to your suspender belt clips. I look for a strong, thick and wide welt so that my stockings last longer but also are easier to fasten to the clip and are not so likely to puncture a hole and ladder the stocking. I highly recommend a good metal clip on your garter belt or suspender belt. Not only will it make you feel stricter, but they make for a saucier soiree. Most suspender belts will have a cheap plastic clip. This is really disappointing, although I understand that suspender belts are no longer used for daily wearing and are more reserved for the boudoir. Briefs under or above the suspender belt? Aside from this rather important debatable point, I recommend three straps for each leg. These are the most easily purchased suspender belts with metal clips. Brands such as Kiss Me Deadly and What Katie Did are the best brands to purchase a metal clipped belt from.